Swimming Pool Wall Foam -- PROTECT AGAINST PUNCTURES! 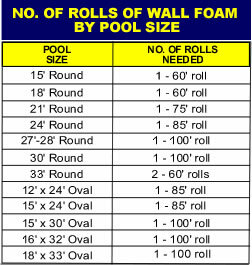 Foam is 1/8" thick x 48" (Except the 125' length which is 42" and commonly used with Inground Pools). Create a smooth wall surface with this 1/8” foam padding that helps to prevent rust, corrosion, and other wall degradation from puncturing your liner. Help keep your liner like-new for years to come with wall foam!